The Kokoda Challenge is located in Papua New Guinea across the infamous Kokoda Trail. The race starts at Owers Corner and finishes in Kokoda and covers a distance of 96 kilometres. The current race record holder in both directions is Brendan Buka, with a best time of 16:34.05 in 2008 from Owers Corner to Kokoda. In 2004 I arrived home one day to find our porters disappointed that Brian Freeman had broken the track record. They felt the record should belong on PNG soil. Russell and I discussed this and decided that in 2005 we would run a race so that the local boys could try and win back the record and their pride. John Hunt Hiviki not only broke the record, he smashed it. Last year we decided to change direction and run the race from the Ower’s Corner end. Brendan Buka won the race in 17 hours 49 minutes. Update 31st August, 2008: Once again Brendan Buka has re written the history books when he broke his old record to win the 2008 Kokoda Challenge Race in a record time of 16:34:05. 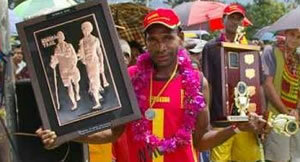 2011 Kokoda Challenge – Race Winner – Owers’ Corner to Kokoda on the 27th August 2011 – Brendan Buka (KTL) in a time of 17:50:33. The race is limited to 70 competitors with 20 places being reserved for international competitors.